Marriage*: He married Rachel Hutchinson, daughter of Benedict Hutchinson and Sarah Naudain, before 1849. [S1] Ruth Bennett, Naudain Family of Delaware (Geneva, Neb. : n.pub., 1941), pp. 17, 33. This material is a typescript of "notes" in Ms. Bennett's possession and apparently was originally written and compiled by James W. Lattomus. Copies are with the D.A.R. Library, Washington, D.C., and Roger Bartlett, Austin, Tex., and can be viewed at http://www.rabgenealogy.com/ui53.htm. The notes contain some inconsistencies, and page 45 was missing from the D.A.R. Library copy when it was copied. Birth*: She was born in 1822. Marriage*: She married William Weldon before 1849. Marriage*: She married Jacob Van Dyke after 1849. Death*: She died in 1911. [S1] Ruth Bennett, Naudain Family of Delaware (Geneva, Neb. : n.pub., 1941), pp. 17, 32-33. This material is a typescript of "notes" in Ms. Bennett's possession and apparently was originally written and compiled by James W. Lattomus. Copies are with the D.A.R. Library, Washington, D.C., and Roger Bartlett, Austin, Tex., and can be viewed at http://www.rabgenealogy.com/ui53.htm. The notes contain some inconsistencies, and page 45 was missing from the D.A.R. Library copy when it was copied. Marriage*: He married Sarah Hutchinson, daughter of Benedict Hutchinson and Sarah Naudain, before 1849. Note*: He was a well-known farmer of Appoquinimink Hundred. Birth*: He was born on 7 October 1801. Marriage*: He married Ann Meldrum on 24 May 1827. Death*: He died on 2 February 1849 at age 47. [S1] Ruth Bennett, Naudain Family of Delaware (Geneva, Neb. : n.pub., 1941), pp. 17, 34. This material is a typescript of "notes" in Ms. Bennett's possession and apparently was originally written and compiled by James W. Lattomus. Copies are with the D.A.R. Library, Washington, D.C., and Roger Bartlett, Austin, Tex., and can be viewed at http://www.rabgenealogy.com/ui53.htm. The notes contain some inconsistencies, and page 45 was missing from the D.A.R. Library copy when it was copied. Birth*: He was born on 4 March 1806. Marriage*: He married Margaret Price on 20 March 1828. Death*: He died on 8 August 1886 at age 80. Birth*: She was born before 1849. [S1] Ruth Bennett, Naudain Family of Delaware (Geneva, Neb. : n.pub., 1941), p. 17. This material is a typescript of "notes" in Ms. Bennett's possession and apparently was originally written and compiled by James W. Lattomus. Copies are with the D.A.R. Library, Washington, D.C., and Roger Bartlett, Austin, Tex., and can be viewed at http://www.rabgenealogy.com/ui53.htm. The notes contain some inconsistencies, and page 45 was missing from the D.A.R. Library copy when it was copied. Birth*: He was born before 1849. Williamsburg, Virginia. They returned to Delaware after their farm was overrun by warring forces during the Civil War, their crops were destroyed, their livestock was driven off, their house was shattered by cannon balls, and they barely escaped with their lives. [S1] Ruth Bennett, Naudain Family of Delaware (Geneva, Neb. : n.pub., 1941), pp. 17, 36. This material is a typescript of "notes" in Ms. Bennett's possession and apparently was originally written and compiled by James W. Lattomus. Copies are with the D.A.R. Library, Washington, D.C., and Roger Bartlett, Austin, Tex., and can be viewed at http://www.rabgenealogy.com/ui53.htm. The notes contain some inconsistencies, and page 45 was missing from the D.A.R. Library copy when it was copied. [S1] Ruth Bennett, Naudain Family of Delaware, above, p. 35 (naming Thomas Lyons as his father). [S1] Ruth Bennett, Naudain Family of Delaware, above, p. 35 (naming Hester Naudain as his mother). [S1] Ruth Bennett, Naudain Family of Delaware, above, p. 35. [S1] Ruth Bennett, Naudain Family of Delaware, above, pp. 16-17 (quoting 20 Feb 1849 petition of William Lyons describing them as husband and wife), 35 (not giving the date), 36 (not giving the date). [S763] Kande Charsha, electronic mail to Roger Bartlett, 9 Sep 2002 (giving his surname as Lyon and not giving the date). [S1] Ruth Bennett, Naudain Family of Delaware, above, p. 35 (naming William Lyons as his father). [S1] Ruth Bennett, Naudain Family of Delaware, above, p. 35 (naming William Lyons as her father). Birth*: He was born in 1819. Marriage*: He married Lydia A. Van Dyke, daughter of Thomas Van Dyke, in 1848. Marriage*: He married Mary Elizabeth Van Dyke, daughter of Thomas Van Dyke, in 1850. Death*: He died in 1859.
death. In his last few years he owned a farm located two or three miles south of Townsend, Delaware. His two wives were sisters. [S1] Ruth Bennett, Naudain Family of Delaware (Geneva, Neb. : n.pub., 1941), pp. 17, 35 (citing grave marker for birth and death years). This material is a typescript of "notes" in Ms. Bennett's possession and apparently was originally written and compiled by James W. Lattomus. Copies are with the D.A.R. Library, Washington, D.C., and Roger Bartlett, Austin, Tex., and can be viewed at http://www.rabgenealogy.com/ui53.htm. The notes contain some inconsistencies, and page 45 was missing from the D.A.R. Library copy when it was copied. Birth*: She was born before 1828. Marriage*: She married James R. Collins before 1849. [S1] Ruth Bennett, Naudain Family of Delaware (Geneva, Neb. : n.pub., 1941), pp. 17, 35. This material is a typescript of "notes" in Ms. Bennett's possession and apparently was originally written and compiled by James W. Lattomus. Copies are with the D.A.R. Library, Washington, D.C., and Roger Bartlett, Austin, Tex., and can be viewed at http://www.rabgenealogy.com/ui53.htm. The notes contain some inconsistencies, and page 45 was missing from the D.A.R. Library copy when it was copied. Marriage*: He married Mary Jane Gooding, daughter of Shadrach Gooding and Hester Naudain, before 1849. Note*: He was a prominent farmer of Appoquinimink Hundred, New Castle County, Delaware. [S1] Ruth Bennett, Naudain Family of Delaware (Geneva, Neb. : n.pub., 1941), pp. 35, 36 (naming Dickinson Webster as her father). This material is a typescript of "notes" in Ms. Bennett's possession and apparently was originally written and compiled by James W. Lattomus. Copies are with the D.A.R. Library, Washington, D.C., and Roger Bartlett, Austin, Tex., and can be viewed at http://www.rabgenealogy.com/ui53.htm. The notes contain some inconsistencies, and page 45 was missing from the D.A.R. Library copy when it was copied. [S1] Ruth Bennett, Naudain Family of Delaware, above, pp. 35, 36 (naming Susanna Naudain as her mother). [S1] Ruth Bennett, Naudain Family of Delaware, above, p. 36. [S763] Kande Charsha, electronic mail to Roger Bartlett, 9 Sep 2002. [S1] Ruth Bennett, Naudain Family of Delaware, above, p. 35 (naming Rebecca Webster as his mother). [S1] Ruth Bennett, Naudain Family of Delaware, above, p. 35 (naming Rebecca Webster as her mother). Marriage*: He married Ann _____. Birth*: He was born before 1797. [S1] Ruth Bennett, Naudain Family of Delaware (Geneva, Neb. : n.pub., 1941), pp. 19, 33, 38. This material is a typescript of "notes" in Ms. Bennett's possession and apparently was originally written and compiled by James W. Lattomus. Copies are with the D.A.R. Library, Washington, D.C., and Roger Bartlett, Austin, Tex., and can be viewed at http://www.rabgenealogy.com/ui53.htm. The notes contain some inconsistencies, and page 45 was missing from the D.A.R. Library copy when it was copied. Birth*: She was born after 1801. Death*: She died after June 1819. [S1] Ruth Bennett, Naudain Family of Delaware (Geneva, Neb. : n.pub., 1941), pp. 20, 42. This material is a typescript of "notes" in Ms. Bennett's possession and apparently was originally written and compiled by James W. Lattomus. Copies are with the D.A.R. Library, Washington, D.C., and Roger Bartlett, Austin, Tex., and can be viewed at http://www.rabgenealogy.com/ui53.htm. The notes contain some inconsistencies, and page 45 was missing from the D.A.R. Library copy when it was copied. Death*: He died on 11 May 1775. Marriage*: He married Catharine Skeer, daughter of Lawrence Skeer, before 1777. [S1] Ruth Bennett, Naudain Family of Delaware (Geneva, Neb. : n.pub., 1941), p. 21. This material is a typescript of "notes" in Ms. Bennett's possession and apparently was originally written and compiled by James W. Lattomus. Copies are with the D.A.R. Library, Washington, D.C., and Roger Bartlett, Austin, Tex., and can be viewed at http://www.rabgenealogy.com/ui53.htm. The notes contain some inconsistencies, and page 45 was missing from the D.A.R. Library copy when it was copied. Arnold S. Naudain house, south of Middleton, Del., from Wikipedia Commons. Birth*: He was born on 11 October 1778 in Appoquinimink Hundred, New Castle County, Delaware. Other Names*: Rev. Arnold Naudain. Note*: He was born near Taylor's Bridge, and he lived on his parents' farm there until about 1810, about age 32. In 1808-1809 he bought about 230 acres of James Schee's land, about a mile and a half south of Middletown, where he built a home and spent his later years. He owned adjacent land and for a while owned Mount Airy. From Ruth Bennett's "Naudain Family of Delaware," p. 44: "He was an intelligent and scientific farmer and brought his land to a high state of cultivation for those times. His habits were studious and his leisure moments were devoted to reading and study. He acquired some knowledge of law and was commissioned by Governor Joseph Haslet as a Justice of the Peace on May 7, 1813. He was a devout student of the Bible and though raised a Presbyterian, became an ordained minister of the Methodist Episcopal Church." His will indicates that he owned several slaves. • A Wikipedia article about the Arnold S. Naudain house near Middleton, Delaware is here. [S1] Ruth Bennett, Naudain Family of Delaware (Geneva, Neb. : n.pub., 1941), pp. 21, 43-47. This material is a typescript of "notes" in Ms. Bennett's possession and apparently was originally written and compiled by James W. Lattomus. Copies are with the D.A.R. Library, Washington, D.C., and Roger Bartlett, Austin, Tex., and can be viewed at http://www.rabgenealogy.com/ui53.htm. The notes contain some inconsistencies, and page 45 was missing from the D.A.R. Library copy when it was copied. [S961] Find A Grave, online at http://www.findagrave.com, memorial for Rev. Arnold S. Naudain, memorial no. 66374174, viewed on 8 May 2017 (not giving the date). [S961] Find A Grave, online, above, memorial for Jemima Naudain, memorial no. 66374181, viewed on 8 May 2017 (not giving the date) (based on tombstone inscription that she was his wife). [S961] Find A Grave, online, above, memorial for Rev. Arnold S. Naudain, memorial no. 66374174, viewed on 8 May 2017 (date as inscribed on his tombstone per the picture included with his memorial). [S1] Ruth Bennett, Naudain Family of Delaware, above, pp. 45-47 (omitting first part of will). [S1] Ruth Bennett, Naudain Family of Delaware, above, pp. 43-44 (naming Arnold Skeer Naudain as her father). Other Names*: Jemima Van Horn Naudain, Jemima Naudain. [S1] Ruth Bennett, Naudain Family of Delaware (Geneva, Neb. : n.pub., 1941), pp. 21, 43. This material is a typescript of "notes" in Ms. Bennett's possession and apparently was originally written and compiled by James W. Lattomus. Copies are with the D.A.R. Library, Washington, D.C., and Roger Bartlett, Austin, Tex., and can be viewed at http://www.rabgenealogy.com/ui53.htm. The notes contain some inconsistencies, and page 45 was missing from the D.A.R. Library copy when it was copied. [S961] Find A Grave, online at http://www.findagrave.com, memorial for Jemima Naudain, memorial no. 66374181, viewed on 8 May 2017 (based on tombstone inscription that she was 61 years old when she died in 1847). [S961] Find A Grave, online, above, memorial for Rev. Arnold S. Naudain, memorial no. 66374174, viewed on 8 May 2017 (not giving the date). [S961] Find A Grave, online, above, memorial for Jemima Naudain, memorial no. 66374181, viewed on 8 May 2017. [S1] Ruth Bennett, Naudain Family of Delaware, above, pp. 43-44 (naming Jemima Van Horn as her mother). Marriage*: She married John H. King. Marriage*: He married Catharine Naudain, daughter of Elias Naudain V and Catharine Skeer. Note*: His ancestors had settled in Delaware during its occupation by the Swedes and Dutch. Birth*: He was born on 11 March 1769. Note*: He was a minister of the Methodist Episcopal Church. Birth*: She was born on 17 March 1772. Birth*: She was born in October 1774. Birth*: He was born on 20 November 1779. Marriage*: He married Ann Mountain in 1807. Death*: He died on 20 October 1842 in White Clay Creek Hundred, New Castle County, Delaware, at age 62. Burial*: Interment was in Methodist Cemetery, Newark, New Castle County, Delaware. Will Excerpts*: ¶ BE IT REMEMBERED that I, James S. Naudain, of White Clay Creek Hundred, New Castle County and State of Delaware (Farmer) being in good health and of sound and disposing mind, memory and understanding, do make and publish this my last Will and Testament (hereby revoking all others) in manner and form following, that is to say. ¶ IMPRIMIS. It is my will that my just debts be first paid. ¶ ITEM. I give, devise and bequeath unto my beloved wife, Ann, all my real and personal estate, situate and being in the County of New Castle aforesaid or elsewhere; to have and to hold the same unto my said wife for and during her natural life or while she remains my widow, and I do hereby authorize and empower my said wife from time to time, if need be, to borrow money and secure it on said premises, so that it may at no time be involved for a greater sum than the mortgage lien at present thereon. ¶ ITEM. After the decease or marriage of my said wife, whichever shall first happen, I give and devise my said estate unto my five children, William, arnold, Ann, Matthew and Mary; to have and to hold the same unto them, my said children, their heirs and assigns forever, share and share alike, as tenants in common, under and subject, nevertheless, to the payment thereout of the following legacies, which I hereby expressly charge thereon. ¶ ITEM. I give unto my three children, Ann M., Matthew and Mary, the sum of One Hundred Dollars each to be paid within one yeqar after the decease or marriage of my said wife as aforesaid, and I hereby expressly charge the same upon my said real estate. ¶ AND LASTLY, I hereby nominate and appoint my said wife Executrix of this my Will. ¶ IN WITNESS WHEREOF, I, James S. Naudain, the said testator, have hereto set my hand and seal, this twenty-ninth day of September, 1842. Note*: He worked on his father's farm until age 27, when he rented one of his father's farms near Summit Bridge. After his father died he moved to White Clay Creek Hundred, where he lived until his death. [S1] Ruth Bennett, Naudain Family of Delaware (Geneva, Neb. : n.pub., 1941), pp. 22, 48-49. This material is a typescript of "notes" in Ms. Bennett's possession and apparently was originally written and compiled by James W. Lattomus. Copies are with the D.A.R. Library, Washington, D.C., and Roger Bartlett, Austin, Tex., and can be viewed at http://www.rabgenealogy.com/ui53.htm. The notes contain some inconsistencies, and page 45 was missing from the D.A.R. Library copy when it was copied. [S1] Ruth Bennett, Naudain Family of Delaware, above, p. 49. Marriage*: She married James Schee Naudain, son of Arnold Naudain Jr. and Mary Schee, in 1807. Death*: She died in July 1852. Other Names*: Ann Mountain March, Ann Mountain Naudain, Ann Naudain. Will Excerpts*: ¶ I, Ann Naudain, on this thirteenth day of June, in the year of our Lord one thousand eight hundred and fifty-two, being in sound mind and considering the uncertainty of life and the certainty of death, think it proper and right to make some desposition [sic] of my worldy affects [sic], I, therefore, order and desire that all my just debts be paid in the first place. ¶ I then will and bequeath to my dear son, William M. Naudain, one feather bed, the one that I am now lying upon. Also I will and bequeath to my dear daughter, Ann M. Naudain, the largest bed, bedstead and bed, also one-half of my bed clothing, also my two card tables and the carpet in the front room and the piece belonging to it with one-half of the contents of the cupboards and my white fore [sic] com [sic]. ¶ I bequeath to my dear daughter, Mary E. Naudain, one yellow bedstead and the best bed that was made and one-half of all the bed clothing, also one-half of the contents of the cupboards, also the largest of the two calners [sic] and the copper tea kettle. ¶ I will and bequest [sic] to my dear son, Arnold Naudain, the two beds he now has in possession. I will and bequeath to my dear son, Matthew M. Naudain, my two horse wagon and cart with the harness of each and also my four hogs. I also will and bequest [sic] and desire that my all of the growing grain shall be equally divided between my three dear children Ann M. Naudain, Mary E. Naudain and Matthew M. Naudain. ¶ I will and bequeath to my dear daughters, Ann M. Naudain and Mary E. Naudain, my two beauroughs [sic], each of them to take one. I also will and bequeath that the balance of my estate be equally divided between my two daughters, Ann M. Naudain and Mary B. Naudain. ¶ IN WITNESS WHEREOF, I have herein set my hand, the day and year above written. ¶ I do on this same day as above written will and bequeath to my dear son, Matthew M. Naudain, my feather bed, and the small red bedstead, the bed he now occupies. Note*: Her name may have been Ann Mountain March when they married. [S1] Ruth Bennett, Naudain Family of Delaware (Geneva, Neb. : n.pub., 1941), pp. 22, 48-50. This material is a typescript of "notes" in Ms. Bennett's possession and apparently was originally written and compiled by James W. Lattomus. Copies are with the D.A.R. Library, Washington, D.C., and Roger Bartlett, Austin, Tex., and can be viewed at http://www.rabgenealogy.com/ui53.htm. The notes contain some inconsistencies, and page 45 was missing from the D.A.R. Library copy when it was copied. [S1] Ruth Bennett, Naudain Family of Delaware, above, p. 50. Birth*: She was born on 27 October 1783. Marriage*: She married William Reynolds, son of Thomas Reynolds, on 17 November 1801. 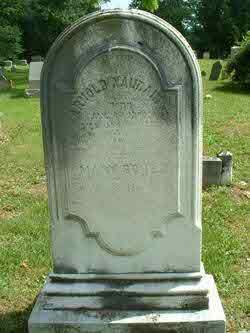 Death*: She died on 20 November 1850 at age 67. Note*: When her husband died in 1821, she and her seven young children moved to Middletown, Delaware, where the children were educated at the academy. [S1] Ruth Bennett, Naudain Family of Delaware (Geneva, Neb. : n.pub., 1941), pp. 22, 51. This material is a typescript of "notes" in Ms. Bennett's possession and apparently was originally written and compiled by James W. Lattomus. Copies are with the D.A.R. Library, Washington, D.C., and Roger Bartlett, Austin, Tex., and can be viewed at http://www.rabgenealogy.com/ui53.htm. The notes contain some inconsistencies, and page 45 was missing from the D.A.R. Library copy when it was copied. Birth*: He was born in 1773 in Appoquinimink Hundred, New Castle County, Delaware. Marriage*: He married Elizabeth Naudain, daughter of Arnold Naudain Jr. and Mary Schee, on 17 November 1801. Death*: He died in 1821. Marriage*: She married Alexander Moody. Birth*: She was born in 1785. Death*: She died on 25 April 1860. Note*: She inherited from her father a 195-acre farm in western St. Georges Hundred, at the southeast corner of the old Choptank Road and the road leading to Mt. Pleasant, where she lived with her son until her death. [S1] Ruth Bennett, Naudain Family of Delaware (Geneva, Neb. : n.pub., 1941), pp. 22, 52. This material is a typescript of "notes" in Ms. Bennett's possession and apparently was originally written and compiled by James W. Lattomus. Copies are with the D.A.R. Library, Washington, D.C., and Roger Bartlett, Austin, Tex., and can be viewed at http://www.rabgenealogy.com/ui53.htm. The notes contain some inconsistencies, and page 45 was missing from the D.A.R. Library copy when it was copied. [S1] Ruth Bennett, Naudain Family of Delaware, above, p. 95 (naming Arnold Naudain as her father). [S1] Ruth Bennett, Naudain Family of Delaware, above, p. 95 (naming Maria Naudain as her mother). Marriage*: He married Maria Naudain, daughter of Arnold Naudain Jr. and Mary Schee. Note*: He was from St. Georges Hundred and had been married before, to Mary Schee, widow of Cornelius Schee. [S1] Ruth Bennett, Naudain Family of Delaware (Geneva, Neb. : n.pub., 1941), p. 22. This material is a typescript of "notes" in Ms. Bennett's possession and apparently was originally written and compiled by James W. Lattomus. Copies are with the D.A.R. Library, Washington, D.C., and Roger Bartlett, Austin, Tex., and can be viewed at http://www.rabgenealogy.com/ui53.htm. The notes contain some inconsistencies, and page 45 was missing from the D.A.R. Library copy when it was copied. Will Excerpts*: ¶ I, John A. Naudain, of Cecil County and State of Maryland . . . .
¶ My will is that all the residue of my goods, stocks, chattels, merchandise and household furniture, with all my negroes lands and all the property I have or shall die possessed of wholly and solely to my wife, Jemima, to her during her natural life, all my personal estate to her forever, and at her death I will all my real estate in the State of Maryland to James Blackston Naudain, son of Dr. James Schee Naudain and Ann Elizabeth, his wife, to him the said James Blackston Naudain to him and his heirs forever. ¶ I will after the death of my wife, Jemima, the large dwelling house and garden in Middletown, Delaware, to my sister, Elizabeth Reynolds, to her and her heirs forever. 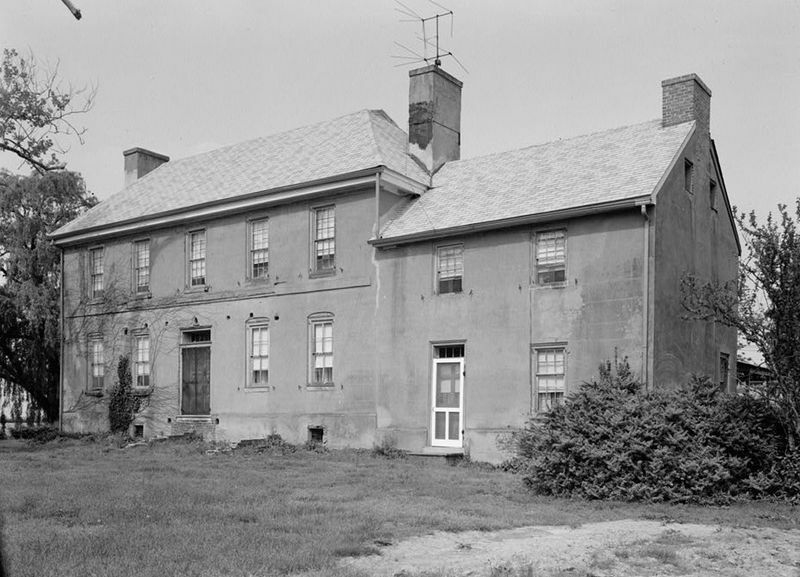 ¶ I will my small dwelling house and garden in Middletown, Delaware, to my sister, Maria Moody, to her and her heirs forever. ¶ Also after the death of my wife, Jemima, I will my piece of marsh in Delaware to my brother, Elias Naudain, to him and his heirs forever. ¶ Finally I constitute and appoint my wife Jemima my sole administratrix of this my last will made the Thirteenth day of January, A. D. 1836. Note*: He was living in Cecil County, Maryland when he died. His will mentioned slaves, a large dwelling house and garden in Middletown, Delaware, a small dwelling house and garden in Middletown, marshland in Delaware, and other real property in Maryland. [S1] Ruth Bennett, Naudain Family of Delaware (Geneva, Neb. : n.pub., 1941), pp. 22, 53-54. This material is a typescript of "notes" in Ms. Bennett's possession and apparently was originally written and compiled by James W. Lattomus. Copies are with the D.A.R. Library, Washington, D.C., and Roger Bartlett, Austin, Tex., and can be viewed at http://www.rabgenealogy.com/ui53.htm. The notes contain some inconsistencies, and page 45 was missing from the D.A.R. Library copy when it was copied. [S720] Dorothy Colburn, comp., Old Drawyers: The First Presbyterian Church in St. George's Hundred (Odessa, Del. : n.pub., 1989), p. 201 (naming Arnold Naudain, Jr. as his father). [S720] Dorothy Colburn, comp., Old Drawyers: The First Presbyterian Church in St. George's Hundred, above, p. 201 (naming Mary Schee as his mother). [S720] Dorothy Colburn, comp., Old Drawyers: The First Presbyterian Church in St. George's Hundred, above, pp. 201, 280 (stating that he died 1 Apr 1836, "aged 50 years"), 300. [S720] Dorothy Colburn, comp., Old Drawyers: The First Presbyterian Church in St. George's Hundred, above, p. 201 (giving her name as Jemima Foard Briscoe and not giving the date). [S720] Dorothy Colburn, comp., Old Drawyers: The First Presbyterian Church in St. George's Hundred, above, pp. 201 (giving only the year), 280, 300 (giving only the year). [S720] Dorothy Colburn, comp., Old Drawyers: The First Presbyterian Church in St. George's Hundred, above, pp. 280, 300. [S1] Ruth Bennett, Naudain Family of Delaware, above, pp. 53-54. Birth*: She was born on 21 January 1779. Marriage*: She married James Blackiston before 1826. Marriage*: She married _____ Briscoe before 1827. Death*: She died in 1858. Note*: When she married John she was the widow of James Blackiston and of _____ Briscoe. She had considerable wealth from her father and her first husband. After John Naudain died, she moved to Middletown, Delaware (presumably from Cecil County, Maryland), where she lived until her death. Her memorial on Find A Grave is here. [S1] Ruth Bennett, Naudain Family of Delaware (Geneva, Neb. : n.pub., 1941), pp. 22, 53, 76. This material is a typescript of "notes" in Ms. Bennett's possession and apparently was originally written and compiled by James W. Lattomus. Copies are with the D.A.R. Library, Washington, D.C., and Roger Bartlett, Austin, Tex., and can be viewed at http://www.rabgenealogy.com/ui53.htm. The notes contain some inconsistencies, and page 45 was missing from the D.A.R. Library copy when it was copied. [S720] Dorothy Colburn, comp., Old Drawyers: The First Presbyterian Church in St. George's Hundred (Odessa, Del. : n.pub., 1989), p. 201 (giving her name as Jemima Foard Briscoe and not giving the date). [S961] Find A Grave, online at http://www.findagrave.com, memorial for Jemima F. Naudain, memorial no. 66374182, viewed on 5 Sep 2011. [S1] Ruth Bennett, Naudain Family of Delaware, above, p. 22 (Jemima Ford). [S1] Ruth Bennett, Naudain Family of Delaware, above, p. 54. Death*: She died in 1859. [S1] Ruth Bennett, Naudain Family of Delaware (Geneva, Neb. : n.pub., 1941), pp. 22, 54. This material is a typescript of "notes" in Ms. Bennett's possession and apparently was originally written and compiled by James W. Lattomus. Copies are with the D.A.R. Library, Washington, D.C., and Roger Bartlett, Austin, Tex., and can be viewed at http://www.rabgenealogy.com/ui53.htm. The notes contain some inconsistencies, and page 45 was missing from the D.A.R. Library copy when it was copied. [S993] Obera Frances Train, Train Connections (n.p. : n. pub., n.d.), p. 171 (citing his appearance in the 1850 Delaware census as a farmer aged fifty-seven years). [S993] Obera Frances Train, Train Connections, above, p. 171. [S993] Obera Frances Train, Train Connections, above, p. 172. [S993] Obera Frances Train, Train Connections, above, p. 171 (naming Elias A. Naudain as his father). [S993] Obera Frances Train, Train Connections, above, p. 171 (naming Elias A. Naudain as her father). [S993] Obera Frances Train, Train Connections (n.p. : n. pub., n.d.), p. 171 (giving her name as Pevey and citing her appearance in the 1850 Delaware census at age forty-six years). [S993] Obera Frances Train, Train Connections, above, p. 171 (naming Pevey _____ as his mother). [S993] Obera Frances Train, Train Connections, above, p. 171 (naming Pevey _____ as her mother). Burial*: Interment was in Oakwood Cemetery, Geneseo, Henry County, Illinois. Birth*: He was born on 1 August 1796 in Appoquinimink Hundred, near Middletown, New Castle County, Delaware. Marriage*: He married Lydia W. Burnham, daughter of John Burnham, in 1836. Death*: He died on 21 December 1872 in Geneseo, Henry County, Illinois, at age 76. Note*: He was tax collector for Appoquinimink Hundred for a few years around 1820-1824. From 1830 to 1856 he lived on a farm near Mt. Pleasant, Delaware that he inherited from his father. He then moved to Genesee, Illinois, where he practiced medicine. His will provided $1,500 for erection of a monument at his grave. [S1] Ruth Bennett, Naudain Family of Delaware (Geneva, Neb. : n.pub., 1941), pp. 22, 54-55. This material is a typescript of "notes" in Ms. Bennett's possession and apparently was originally written and compiled by James W. Lattomus. Copies are with the D.A.R. Library, Washington, D.C., and Roger Bartlett, Austin, Tex., and can be viewed at http://www.rabgenealogy.com/ui53.htm. The notes contain some inconsistencies, and page 45 was missing from the D.A.R. Library copy when it was copied. Marriage*: She married Dr. Thomas Naudain, son of Arnold Naudain Jr. and Mary Schee, in 1836. Note*: She was the widow of John Burnham. Death*: She died on 25 December 1816. Marriage*: She married Andrew Naudain, son of Arnold Naudain Sr. and Catharine Allfree, on 25 December 1816. [S1] Ruth Bennett, Naudain Family of Delaware (Geneva, Neb. : n.pub., 1941), p. 23. This material is a typescript of "notes" in Ms. Bennett's possession and apparently was originally written and compiled by James W. Lattomus. Copies are with the D.A.R. Library, Washington, D.C., and Roger Bartlett, Austin, Tex., and can be viewed at http://www.rabgenealogy.com/ui53.htm. The notes contain some inconsistencies, and page 45 was missing from the D.A.R. Library copy when it was copied. Birth*: She was born on 6 December 1787. Death*: She died on 12 April 1799 at age 11. 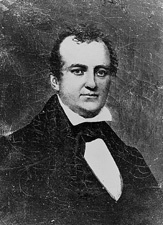 Sen. Arnold Naudain, from Biographical Directory of United States Congress online. • Sen. Naudain's biography in Biographical Directory of the United States Congress is here. • A Wikipedia article about Sen. Naudain is here. [S1] Ruth Bennett, Naudain Family of Delaware (Geneva, Neb. : n.pub., 1941), pp. 23, 55-60. This material is a typescript of "notes" in Ms. Bennett's possession and apparently was originally written and compiled by James W. Lattomus. Copies are with the D.A.R. Library, Washington, D.C., and Roger Bartlett, Austin, Tex., and can be viewed at http://www.rabgenealogy.com/ui53.htm. The notes contain some inconsistencies, and page 45 was missing from the D.A.R. Library copy when it was copied. [S720] Dorothy Colburn, comp., Old Drawyers: The First Presbyterian Church in St. George's Hundred (Odessa, Del. : n.pub., 1989), p. 200 (naming Andrew Naudain as his father). [S1082] William Henry Egle, Pennsylvania Genealogies, Chiefly Scotch-Irish and German (Harrisburg, Penn. : Harrisburg Pub. Co., 1896), p. 328 (naming Andrew Naudain as his father). [S720] Dorothy Colburn, comp., Old Drawyers: The First Presbyterian Church in St. George's Hundred, above, p. 200 (naming Rebecca Snow as his mother). [S1082] William Henry Egle, Pennsylvania Genealogies, Chiefly Scotch-Irish and German, above, p. 328 (naming Rebecka Snow as his mother). [S720] Dorothy Colburn, comp., Old Drawyers: The First Presbyterian Church in St. George's Hundred, above, pp. 200 (giving only the date and not naming the place), 280 (giving only the date and not naming the place), 299 (giving only the year and not naming the place), 325 (giving only the year and not naming the place). [S1082] William Henry Egle, Pennsylvania Genealogies, Chiefly Scotch-Irish and German, above, p. 328 (stating that he was born in 1790 without naming the place). [S961] Find A Grave, online at http://www.findagrave.com, memorial for Arnold Naudain, memorial no. 7526203, viewed on 3 Apr 2010 (stating that he was born in Dover, Del.). [S720] Dorothy Colburn, comp., Old Drawyers: The First Presbyterian Church in St. George's Hundred, above, pp. 200, 201 (not giving the date). [S1082] William Henry Egle, Pennsylvania Genealogies, Chiefly Scotch-Irish and German, above, p. 328 (stating that they married in 1810). [S1082] William Henry Egle, Pennsylvania Genealogies, Chiefly Scotch-Irish and German, above, p. 328 (stating that he died in 1872 without naming the place). [S961] Find A Grave, online, above, memorial for Arnold Naudain, memorial no. 7526203, viewed on 3 Apr 2010. [S720] Dorothy Colburn, comp., Old Drawyers: The First Presbyterian Church in St. George's Hundred, above, pp. 280, 299, 325. [S1382] Adams Sentinel, Gettysburg, Pa., online at http://www.newspapers.com, 10 Mar 1845, p. 3, col. 4. [S1360] The Chicago Tribune, Chicago, Ill., online at http://www.newspapers.com, 12 Jan 1872, p. 5, col. 5. [S1082] William Henry Egle, Pennsylvania Genealogies, Chiefly Scotch-Irish and German, above, p. 329. [S720] Dorothy Colburn, comp., Old Drawyers: The First Presbyterian Church in St. George's Hundred, above, p. 201 (naming Arnold Naudain, M.D. as his father). [S1082] William Henry Egle, Pennsylvania Genealogies, Chiefly Scotch-Irish and German, above, p. 329 (naming Dr. Arnold Naudain as his father). [S720] Dorothy Colburn, comp., Old Drawyers: The First Presbyterian Church in St. George's Hundred, above, p. 200 (naming Arnold Naudain, M.D. as his father). [S720] Dorothy Colburn, comp., Old Drawyers: The First Presbyterian Church in St. George's Hundred, above, p. 200 (naming Arnold Naudain, M.D. as her father). [S1082] William Henry Egle, Pennsylvania Genealogies, Chiefly Scotch-Irish and German, above, p. 329 (naming Dr. Arnold Naudain as her father). [S1] Ruth Bennett, Naudain Family of Delaware, above, p. 55 (naming Arnold Naudain as her father). [S1082] William Henry Egle, Pennsylvania Genealogies, Chiefly Scotch-Irish and German, above, p. 327 (naming Dr. Arnold Naudain as her father). [S720] Dorothy Colburn, comp., Old Drawyers: The First Presbyterian Church in St. George's Hundred, above, pp. 200, 280 (naming Arnold Naudain, M.D. as her father). Mary and Arnold Naudain's tombstone, Old Drawyers Church, Odessa, New Castle County, Del., from findagrave.com, by Russ Pickett. [S1] Ruth Bennett, Naudain Family of Delaware (Geneva, Neb. : n.pub., 1941), pp. 23, 30, 55-57. This material is a typescript of "notes" in Ms. Bennett's possession and apparently was originally written and compiled by James W. Lattomus. Copies are with the D.A.R. Library, Washington, D.C., and Roger Bartlett, Austin, Tex., and can be viewed at http://www.rabgenealogy.com/ui53.htm. The notes contain some inconsistencies, and page 45 was missing from the D.A.R. Library copy when it was copied. [S1082] William Henry Egle, Pennsylvania Genealogies, Chiefly Scotch-Irish and German (Harrisburg, Penn. : Harrisburg Pub. Co., 1896), p. 328 (naming Hermanus Schee as her father). [S1082] William Henry Egle, Pennsylvania Genealogies, Chiefly Scotch-Irish and German, above, p. 328 (naming Mary Naudain as her mother). [S720] Dorothy Colburn, comp., Old Drawyers: The First Presbyterian Church in St. George's Hundred (Odessa, Del. : n.pub., 1989), pp. 201, 280, 300 (giving only the year), 325 (giving only the year). [S961] Find A Grave, online at http://www.findagrave.com, memorial for viewed on 3 Apr 2010 (Mary M. Schee Naudain, memorial no. 14449429). [S720] Dorothy Colburn, comp., Old Drawyers: The First Presbyterian Church in St. George's Hundred, above, pp. 201 (giving only the date and not naming the place), 280 (giving only the date and not naming the place), 300 (giving only the year and not naming the place), 325 (giving only the year and not naming the place). [S1082] William Henry Egle, Pennsylvania Genealogies, Chiefly Scotch-Irish and German, above, p. 328 (stating that she died in 1860 without naming the place). [S961] Find A Grave, online, above, memorial for viewed on 3 Apr 2010 (Mary M. Schee Naudain, memorial no. 14449429) (giving the date but not the place). [S720] Dorothy Colburn, comp., Old Drawyers: The First Presbyterian Church in St. George's Hundred, above, pp. 280, 300, 325. [S1] Ruth Bennett, Naudain Family of Delaware, above, p. 57. [S720] Dorothy Colburn, comp., Old Drawyers: The First Presbyterian Church in St. George's Hundred, above, p. 201 (naming James Schee as her father). [S1082] William Henry Egle, Pennsylvania Genealogies, Chiefly Scotch-Irish and German, above, p. 328 (stating that she was born in 1787). [S1082] William Henry Egle, Pennsylvania Genealogies, Chiefly Scotch-Irish and German, above, p. 329 (naming Mary Schee as his mother). [S720] Dorothy Colburn, comp., Old Drawyers: The First Presbyterian Church in St. George's Hundred, above, p. 200 (naming Mary Schee as his mother). [S1082] William Henry Egle, Pennsylvania Genealogies, Chiefly Scotch-Irish and German, above, p. 329 (naming Mary Schee as her mother). [S1] Ruth Bennett, Naudain Family of Delaware, above, p. 55 (naming Mary Schee as her mother). [S1082] William Henry Egle, Pennsylvania Genealogies, Chiefly Scotch-Irish and German, above, p. 327 (naming Mary Schee as her mother). [S720] Dorothy Colburn, comp., Old Drawyers: The First Presbyterian Church in St. George's Hundred, above, pp. 200 (naming Mary Schee as her mother), 280 (naming Mary Naudain as her mother). Birth*: She was born on 26 July 1792. Death*: She died on 16 July 1811 at age 18. Note*: She had no children. Birth*: He was born on 16 January 1795 in Snowland (Naudain's Landing), near Leipsic, Kent County, Delaware. Marriage*: He married Margaret Pettigrew Meillechamp in 1828. Death*: He died on 12 March 1849 in Snowland (Naudain's Landing), near Leipsic, Kent County, Delaware, at age 54. Note*: During the 1820's he was justice of the peace in Leipsic, in Little Creek Hundred. He served in the lower house of the Delaware General Assembly in 1827 and in that same year was commissioned first major of the Fourth Regiment of the Delaware Militia. In 1832 he was elected a delegate to the convention to revise the Delaware Constitution. He later was elected to the Delaware Senate. From McCarter and Jackson, "Historical and Biographical Encyclopedia of Delaware" (1882): "He resided always upon the domain left to him by his father, cherishing to his last hour the associates of his boyhood, and a fondness for agriculture; as is attested by the fact that he left behind him the best improved lands in Kent an unknown place . He was a man of singular excellence and purity of character. . . . He was a man of most courteous and agreeable manners, the natural outgrowth of a true and manly heart, a Christian and an elder in the Presbyterian Church. His name should long be cherished as one of the worthiest of the sons of the ancient Delaware State." • His 1882 biography from the Encyclopedia of Delaware is here. [S1] Ruth Bennett, Naudain Family of Delaware (Geneva, Neb. : n.pub., 1941), pp. 24, 60-61 (quoting from McCarter & Jackson, "Historical and Biographical Encyclopedia of Delaware" (1882)). This material is a typescript of "notes" in Ms. Bennett's possession and apparently was originally written and compiled by James W. Lattomus. Copies are with the D.A.R. Library, Washington, D.C., and Roger Bartlett, Austin, Tex., and can be viewed at http://www.rabgenealogy.com/ui53.htm. The notes contain some inconsistencies, and page 45 was missing from the D.A.R. Library copy when it was copied. [S721] Encyclopedia of Delaware (Wilmington, Del. : Aldine Pub. & Engraving Co., 1882), n. p. (biography of Dr. James Jones) (not giving the date). [S721] Encyclopedia of Delaware (Wilmington, Del. : Aldine Pub. & Engraving Co., 1882), n. p. (biography of Dr. James Jones) (naming Maj. Elias Naudain as her father). [S1] Ruth Bennett, Naudain Family of Delaware, above, p. 60 (naming Elias Naudain as her father). Death*: She died in 1826. [S1] Ruth Bennett, Naudain Family of Delaware (Geneva, Neb. : n.pub., 1941), pp. 24, 60-61. This material is a typescript of "notes" in Ms. Bennett's possession and apparently was originally written and compiled by James W. Lattomus. Copies are with the D.A.R. Library, Washington, D.C., and Roger Bartlett, Austin, Tex., and can be viewed at http://www.rabgenealogy.com/ui53.htm. The notes contain some inconsistencies, and page 45 was missing from the D.A.R. Library copy when it was copied. [S1] Ruth Bennett, Naudain Family of Delaware, above, p. 61 (naming Dr. James Jones as her father, quoting from McCarter & Jackson, Historical and Biographical Encyclopedia of Delaware (1882)). [S721] Encyclopedia of Delaware (Wilmington, Del. : Aldine Pub. & Engraving Co., 1882), n. p. (biography of Dr. James Jones) (naming Dr. James Jones as her father). [S721] Encyclopedia of Delaware (Wilmington, Del. : Aldine Pub. & Engraving Co., 1882), n. p. (biography of Dr. James Jones) (naming Mary Creighton as her mother). [S248] Supposition as to place, (based on parents' believed residence at time). [S721] Encyclopedia of Delaware (Wilmington, Del. : Aldine Pub. & Engraving Co., 1882), n. p. (biography of Dr. James Jones) (naming Lydia Jones as her mother). Marriage*: She married Maj. Elias Naudain, son of Andrew Naudain and Rebecca Snow, in 1828. Other Names*: Margaret Pettigrew Meillechamp Naudain, Margaret Meillechamp Naudain, Margaret Pettigrew Naudain, Margaret Naudain. [S1359] The Times, Philadelphia, Pa., online at http://www.newspapers.com, 4 Sep 1885, p. 3, col. 5 (obituary of Margaret P. Naudain) (not giving the date but stating that she was "in the 82d year of her age" when she died on 2 Sep 1885). [S1359] The Times, Philadelphia, Pa., above, 4 Sep 1885, p. 3, col. 5 (obituary of Margaret P. Naudain). [S1359] The Times, Philadelphia, Pa., above, 4 Sep 1885, p. 3, col. 5. [S1] Ruth Bennett, Naudain Family of Delaware, above, p. 60 (naming Margaret Pettigres Meillechamp as her mother). Marriage*: She married John Eddowes. Birth*: She was born on 26 January 1797. Death*: She died in 1866 in Galena, Jo Daviess County, Illinois. Note*: They moved to Galena, Illinois. [S1] Ruth Bennett, Naudain Family of Delaware (Geneva, Neb. : n.pub., 1941), pp. 24, 61-62. This material is a typescript of "notes" in Ms. Bennett's possession and apparently was originally written and compiled by James W. Lattomus. Copies are with the D.A.R. Library, Washington, D.C., and Roger Bartlett, Austin, Tex., and can be viewed at http://www.rabgenealogy.com/ui53.htm. The notes contain some inconsistencies, and page 45 was missing from the D.A.R. Library copy when it was copied. [S1] Ruth Bennett, Naudain Family of Delaware, above, pp. 61-62 (naming Lydia Naudain as her mother). Marriage*: He married Lydia Naudain, daughter of Andrew Naudain and Rebecca Snow. Note*: He survived his wife, Lydia, and died at age 80. [S1] Ruth Bennett, Naudain Family of Delaware, above, pp. 61-62 (naming John Eddowes as her father).